Application Performance Management is adopting an approach which allows you to measure the end-user experience across your applications, helping you quantify business impacts with a resolution. In this article we will cover two approaches to Application Performance Management. 1) Synthetic (Active Monitoring): Collecting data from dispersed agents which simulate the way real users interact with your applications. 2) Real-user (Passive Monitoring): Collecting data from real users based on the actual experience and behaviours as users are interacting with your applications. Active monitoring enables you to identify problems and determine performance issues, downtime and transaction failures before your end-users or customers. It does not require actual traffic (as required by passive monitoring) which helps organisations validate applications 24 x 7 or prior to a production launch. Active monitoring allows you to proactively monitor applications in across all environments i.e staging & production environments from any node (host) running on the Internet backbone including private agents located inside or outside your firewall. Active monitoring can be used to measure “before-and-after” performance when upgrading or implementing virtual infrastructures, consolidating data centers and migrating servers. Transactions can be compared to historic transactions with reference to events which may have occurred across your infrastructure/applications. It is important to configure an incident management process to capture issues the moment they occur allowing you to identify, isolate and resolve the problem to protect important revenue and brand reputation. Figure below demonstrates three (3) transactions created to measure response times & availability for an online shopping process. (i.e. Browser or Application, Screen Shots, Videos, Log Files, Memory, CPU and other system KPI’s). Both active and passive application monitoring provide critical performance monitoring data. It is important to adopt an approach that combines both forms of monitoring as part of your application management solution. The main objective is to ensure that application issues are detected before they impact your customers and end users. When you outsource your application monitoring to TestPoint we can help you validate and manage SLA’s which you have in place. Speak with TestPoint today for a proactive 24/7 automated application performance management solution. 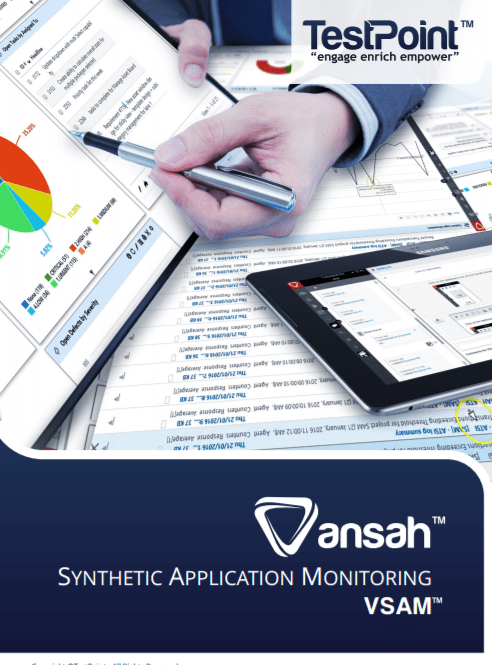 Vansah VSAM™ synthetic monitoring allows you to proactively monitor your web, non-web, legacy, mobile, streaming and cloud-based applications in staging & production environments to ensure performance will meet your end user requirements.